0.1Stuart Binny to Quinton De Kock. no run, No run. Jofra Archer gives a quick interview. Says that he is loving this place and likes to bowl here. Adds that he practices yorkers and it is his go-to delivery. Also states that if the pitch is doing a bit, he loves to bowl upfront and bowl a bit in the end overs. 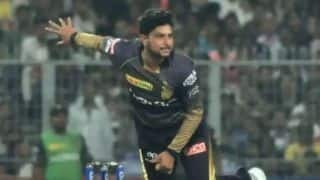 Wants to bowl well today and try to win the match for his team. 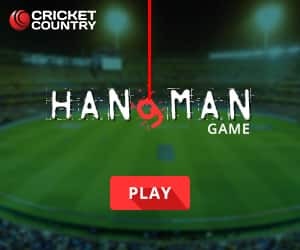 Mumbai (Playing XI) - Rohit Sharma(C), Quinton de Kock(WK), Suryakumar Yadav, Krunal Pandya, Hardik Pandya, Kieron Pollard, Ben Cutting, Rahul Chahar, Mayank Markande (In for Jayant Yadav), Lasith Malinga, Jasprit Bumrah. 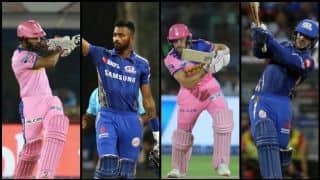 Rajasthan (Playing XI) - Sanju Samson(WK), Steven Smith(C) (In for Jos Buttler), Ajinkya Rahane, Ben Stokes (In for Ish Sodhi), Ashton Turner, Stuart Binny, Riyan Parag (In for Rahul Tripathi), Jofra Archer, Shreyas Gopal, Jaydev Unadkat, Dhawal Kulkarni. Mumbai skipper, Rohit Sharma is surprised by the looks of the surface as it has grass only on one side of the pitch. He reckons it's naturally a slow surface here and he would have batted first anyway given their success while defending totals. Wants to keep improving as a unit and is proud of the fact that everyone has contributed but also mentions that there is always room for improvement. Regarding his team, Rohit informs that unfortunately, Jayant Yadav misses out in favour of Mayank Markande, and it's a tactical change. Rajasthan skipper, Steven Smith says that they will bowl as he is unsure how the pitch will behave and it's good for batting under lights. Adds that Rahane has done a terrific job for the team and it's management's decision but Jinx is still a part of the leadership group. Reminds that he has had success with the leadership role in this tournament before and is looking forward to this challenge. 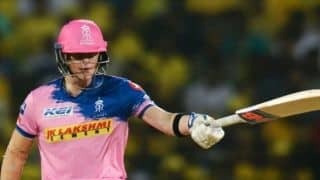 Informs about the three changes for Rajasthan - Ben Stokes, Steven Smith and Riyan Parag come in for Jos Buttler, Ish Sodhi and Rahul Tripathi. Toss - Up goes the coin, Rohit Sharma calls it wrongly and RAJASTHAN WILL FIELD! Pitch report - Graeme Smith says it is a patchy surface. He adds there is lot of dryness on this track and also says it will help the seamers if they bowl stump-to-stump line. Ends by mentioning that the team which wins the toss should bat first. Warm welcome everyone for Match 36 of this year's Indian T20 League between Rajasthan and Mumbai at the Sawai Mansingh Stadium. 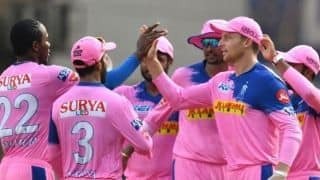 In their previous meeting, the pink team thumped the blue team at the Wankhede Stadium and revenge will be on the menu for the Rohit-led team. Mumbai are on a hot run and will be eyeing their third win in a row today. For Rajasthan, plenty has happened overnight. Ajinkya Rahane has been removed from captaincy and Steven Smith has been handed over the reins for the rest of the tournament. Also, Jos Buttler has flown back home for the birth of his first child. Now, that will leave a big void in their batting at the top of the order. Expect a different combination from the home team for this contest. Stay tuned for all the information. 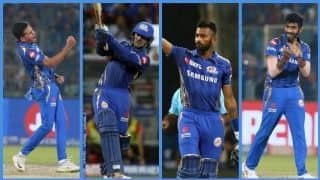 Placed second from bottom, Rajasthan Royals‘ previous and only second win came against Mumbai Indians roughly a week ago – also their opponents on Saturday in Match 36 of the IPL 2019. Since then, the Royals have gone down against the Kings XI Punjab while MI have registered consecutive wins. 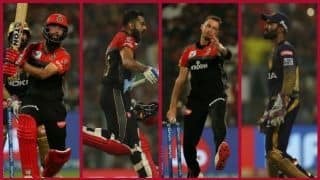 With six matches left, the Royals will be keen to seek resurgence now more than ever, but in MI, they face a formidable opponents even though the three-time IPL winners lost the previous encounter by four wickets. Jos Buttler and Shreyas Gopal had starred the first time these two sides faced each other. But here’s where it gets tricky for the Royals. Like the Delhi Capitals, the Royals have a pretty abysmal record at home as well. At the Sawai Man Singh stadium so far, the Royals have lost three matches barring the win against Royal Challengers Bangalore. 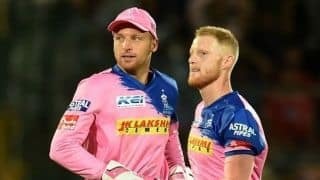 Buttler and Gopal have led the side defiantly while the likes of Steve Smith and Ben Stokes haven’t quite lived up to the reputation. It will be a crucial test for the Royals’ middle order against a fiery MI bowling attack as they try and stage an inspiring turnaround here onward. Speaking of turnaround, it’s something that MI have forged a pretty stunning one this season. After missing out the Playoffs last season, MI have been at their dominating best and it reflects through their position on the points table. With a resounding win over the Capitals, Mumbai have leapfrogged them to be placed second on the leaderboard. 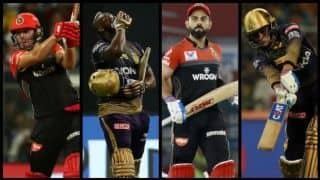 The opening pair is finally getting them the starts, the middle-lower order is firing more often than not, and in each match, a new name is standing up to the challenge and making the most of the opportunity. 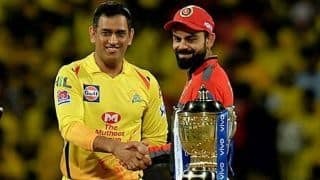 With one leg on the Playoff door, Mumbai are firm favourites to go top with another win – they have a better run rate than table-toppers Chennai Super Kings. As for the for the Royals, well, time is slipping quickly.